The pod of quartz ,that in September produced some nice blue and yellow beryls, continued to bear fruit as we carefully mined it forward. The pod was immense for the Orchard. It extends at least 6' into the floor of the pit making the overall size more than 9' deep by 5' wide by 20' along strike Only the upper 3' though contained beryl. In the photo at the left, Richard poses with some of the beryl from this pod. The exceptional beryl at the top of the page was accidentally blasted from the quartz and landed miraculously, relatively unharmed, in the muck pile. 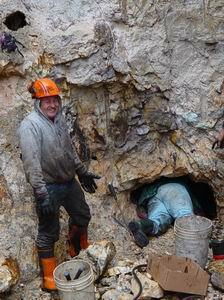 While our attention was drawn to the large beryls still in the quartz, Richard noticed a small blue chip in the pile. Picking it up, to his amazement, the chip grew to be this specimen of more than 30 cm . At the right, Mary takes her turn posing with this find. Using a small air powered drill, feathers and wedges we did the best job we could to extract more these beryls. 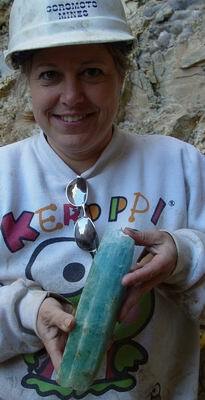 Mary was able to re-assemble the largest beryl from the pod, yielding a specimen of more than 2' in length. The size of these beryls were reminiscent of reports from the early history of the Orchard where it was said that large beryls were commonplace. A mere 200' along strike separated the zones though. 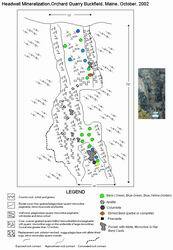 As we mined this area, it was clear there was a sizable pocket nearby. The manganese dendrites and the foliated and kaolinized feldspar was a dead give away. Our hopes were high that when we found this pocket it would yield something more than the usual list of culprits.... quartz crystals, albite and few apatite. 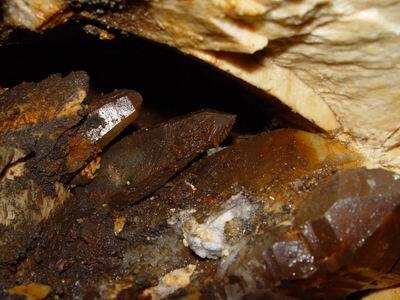 The upper portion of the quartz pod can been seen tapering to a fine stringer. As we placed our next series of holes conservatively to either side of this stringer, we detected the pocket. The pocket proved to be a large one as everyhting in this area of the pegmatite seems to be of larger protions. Unfortunately, so far anyway, the pocket system contains the usual. What differentiates this one perhaps is the nice quartz crystal groups on feldspar plates it produced. 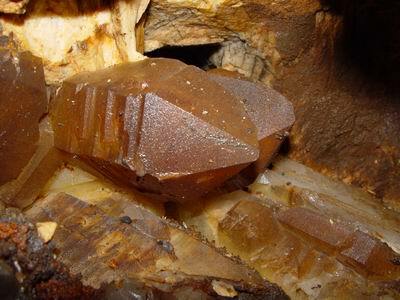 It made our hearts sink to see beryl casts on the walls of this pocket of the dimension of the beryls in the quartz. As we pursued this system it continued right into the base of the headwall and beyond reach. 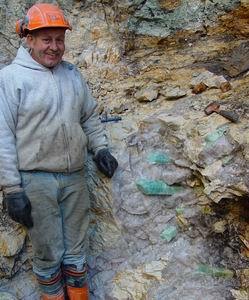 The mineralization continues to look promising. 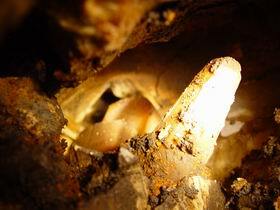 The creamy kaolinized spar in areas can be dug with a spoon. More is in there somewhere. A few views of the pocket interior. 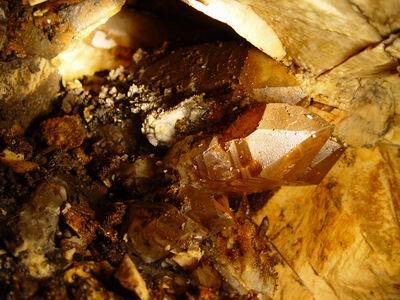 Average size of larger quartz crystals is 15 cm.